Many promotional prints where made during SHA. Here is a nice collection :) Enjoy! 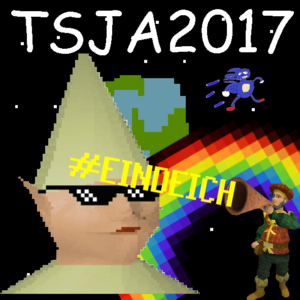 Below designs where created by Stitch, DerChris and Kartoffel to promote SHA2017. Feel free to make your own and share it here. Already 60.000+ stickers where printed and spread at various occasions. 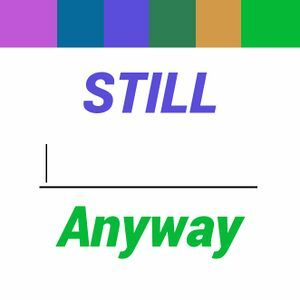 Still ___________ Anyway. 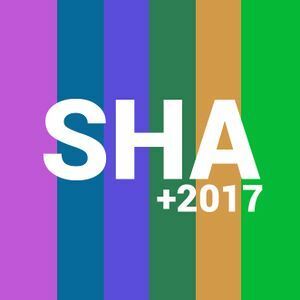 SHA is what you make of it. The design of SHA is based on the Free Speech Flag. A detailed blogpost should emerge in a few days / weeks that explains a lot of the design choices and how they relate to this community. The design team had the idea to make a sticker with a hash-code. When searching the hash, you'll find the SHA website. Currently you'll find both the SHA website and an uncracked hash in the hash cracker. Who will find the true meaning of this hash? :) - This sticker proved to be the most popular sticker during 33c3, with all of them gone. Inspiration created by Dave, made by Stitch. This logo spoofs the Dutch government formal design. They carry this design in letterheads and websites, amongst other locations. The funny bit is that both the logo and the fonts are behind a login. But of course you can find them elsewhere, for example on wikimedia commons. The logo has been altered to contain our famous shrug, the hacker glider and the most over the top cyber-slogan imaginable. Made by Stitch. A very closed design made out of four hexagon shapes. Proved to be the least popular sticker when released on 33c3. It got the name "dance festival" as the logo is interchangeable with any large (hard dance) dance festival. Made by Stitch. 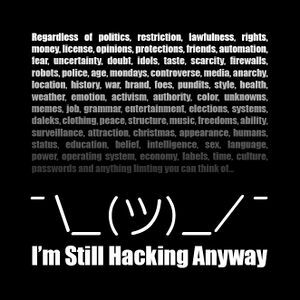 Regardless of X, I'm Still Hacking Anyway. 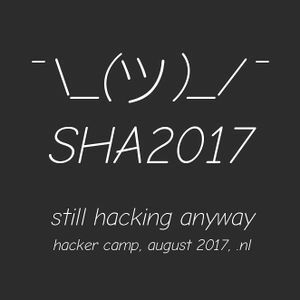 Exploring the real meaning of SHA: whatever happens, no matter the weather, we're still hacking anyway. Made by Stitch. 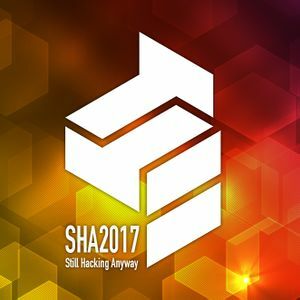 As there was no design for SHA2017, the moment they arrived it would have looked a bit like this. 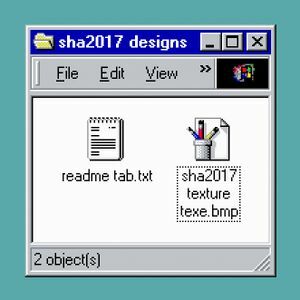 Using a e s t h e t i c s styling, the sticker also contains a reverse name exploit on both files (hence exe and bat). Opening any of these files would lead to a program being executed instead of an image or text being loaded. Made by Stitch. Sticker to make fun of the NSA. They may have an unlimited budget, but it costs nothing and is priceless to make fun of them. Made by DerChris. A troll sticker released into the wild on the september 2016 orga meeting. #eindeich refers to the single dyke on the terrain. Made by Kartoffel. 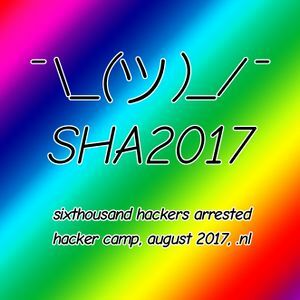 Sixty hackers arrested was an acronym first coined on IRC on the Techinc channel. Maybe created by a bot. Given the event can have a maximum of 6000 visitors, using an intentional spelling error would be the obvious way to go. Made by Stitch. The first sticker, simple design with the shrug for SHA. Contains a series of information on the bottom that looks like a URL. Has been dropped. The Still Hacking Anyway acronym expansion was not determined then yet. Made by Stitch. This page was last modified on 18 April 2019, at 18:20.